Hope you are all doing great. We have seen a lot of simple concepts until now. Just for your benefit, I have created a Menu bar with all the articles segregated according to their relevance. I hope the new visitors will go through my previous articles to understand some basic fundamentals which are key to creating wealth in the Stock Market. In the last couple of years, I have received a lot of email queries asking me, "Which is the best investing instrument available today?". The answer truly depends on the lifestyle, personality, financial goals & saving habit of the individual. I am sure most of us have been investing in shares. Today, let us look at another investing instrument which is considered much safer and steadier as compared to investing directly in equity shares. We have all heard about Mutual Funds. Today, let us try to understand what they really are. A Mutual Fund is an investment instrument that allow various investors to pool in their capital or resources in order to collectively purchase stocks, bonds or other such securities. Please remember that, in this unique investment vehicle, you are joining hundreds and thousands of other investors to invest in a common pool. Let us take a quick look at the brief history of Mutual Funds in India. The Mutual Fund industry in India began in 1963 with the formation of the Unit Trust of India (UTI) as an initiative of the Government of India and the Reserve Bank of India. Much later, in 1987, SBI Mutual Fund became the first non-UTI Mutual Fund in India. Subsequently, the year 1993 heralded a new era in the Mutual Fund industry. This was marked by the entry of private companies in the sector. After the Securities and Exchange Board of India (SEBI) Act was passed in 1992, the SEBI Mutual Fund Regulations came into being in 1996. Since then, the Mutual Fund companies have continued to grow exponentially with foreign institutions setting shop in India, through joint ventures and acquisitions. As the industry expanded, a non-profit organization, the Association of Mutual Funds in India (AMFI), was established on 1995. Its objective is to promote healthy and ethical marketing practices in the Indian Mutual Fund Industry. SEBI has made AMFI certification mandatory for all those engaged in selling or marketing mutual fund products. Fund Manager - This is probably the most important aspect of investing in a pool. When multiple investors collect their money, someone needs to manage it meticulously. The Fund Manager is responsible to invest the collated money on the behalf of investors into various investing instruments. This is a huge responsibility since he/she is managing hard earned money of the investors. The track record of the Fund Manager is extremely important while picking a Fund. Assets under Management (AUM) - The total market value of the collective funds invested. If you look at any mutual fund, you can find the AUM Value. The higher the AUM, the more stable the fund is. Mutual Fund Company - The organization which manages the funds of the investors. Portfolio - The combined underlying holding of the Fund is known as Portfolio. Units - The portion of the portfolio which the investor owns in the Fund. Generally, based on the NAV, we can buy the number of units which we can afford based on our investment plan. a) Equity Funds : Equities are the most popular mutual fund category amongst retail investors. Although it could be a high-risk investment in the short term, investors can expect capital appreciation in the long run. If you are at your prime earning stage and looking for long-term benefits, growth schemes could be an ideal investment. In equity funds, you have funds allocating capital to certain sectors (Sectoral Funds), index stocks (Index Funds), Small/Mid/Large Cap stocks or Diversified across various sectors. In Equity Funds, apart from the above mentioned, the Tax Saving Equity Linked Savings Scheme (ELSS) is very popular. These funds choose outperforming companies which give return over the long term. Many investors choose these Tax Saving ELSS Mutual Funds to save tax and invest over a longer horizon. Once the Tax Saving ELSS scheme is chosen, the capital is locked for 3 years from the time the units come into the Demat Account. b) Debt Funds : In a debt scheme, a major part of the fund is channelized towards debentures, government securities, and other debt instruments. Although capital appreciation is low (compared to the equity mutual funds), this is a relatively low risk-low return investment avenue which is ideal for investors seeing a steady income. c) Money Market Funds : This is ideal for investors looking to utilize their surplus funds in short term instruments while awaiting better options. These schemes invest in short-term debt instruments and seek to provide reasonable returns for the investors. d) Balanced Funds : This scheme allows investors to enjoy growth and income at regular intervals. Funds are invested in both equities and fixed income securities; the proportion is pre-determined and disclosed in the scheme related offer document. These are ideal for the cautiously aggressive investors. In India, this type of scheme has a pre defined maturity period. Please note that investors can invest only during the initial launch period known as the NFO (New Fund Offer) period. This will be announced when the Fund is getting launched and the brokers come to know about it. a) Capital Protection : The primary objective of this scheme is to safeguard the principal amount while trying to deliver reasonable returns. These invest in high-quality fixed income securities with marginal exposure to equities and mature along with the maturity period of the scheme. b) Fixed Maturity Plans (FMPs) - These schemes normally comprise of debt instruments which mature in line with the maturity of the scheme, thereby earning through the interest component (also called coupons) of the securities in the portfolio. FMPs are normally passively managed, i.e. there is no active trading of debt instruments in the portfolio. Generally, a combination of Open and Closed Ended funds where investors can trade units at pre defined intervals. Also, periodically, the investment company offers to repurchase the shares from shareholders. 2) When we collectively pool into a Mutual Fund, the money is invested in a wide range of securities. Due to this diversification, the risk is minimized. When we choose our funds based on our temperament and long term goals, we can create wealth in the long term. Choosing the type of mutual fund (Sector, Large/Mid/Small Cap, Debt etc) is key. 4) Mutual Funds provide very high liquidity for the investors. It is very easy to sell off units at any given point of time if we are in need to money. In equities, there are some shares which have low volume. That kind of risk is minimal in Mutual Fund since there is diversification. 5) Tax Saving ELSS Funds are the best way to save tax and create wealth over a long term. 6) Normally, the returns on most mutual funds, when held more than a year, are tax free. This is also a very good motive to hold quality funds for longer term. 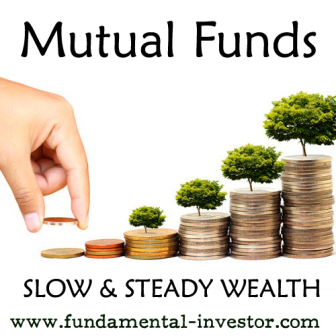 1) The main disadvantage of Mutual Funds is that you cannot expect to get quick returns. You need to give a Mutual Fund time to perform. In equities, the returns can be much faster. When the major population of investors are looking at daily returns, this is the wrong place for them. 3) Even though locking periods are a necessity in Mutual Funds, investors get trapped when they need urgent cash. For example, ELSS has a lock-in period of 3 years. If money is required during this period, the investor will not be able to withdraw the same easily. 4) Since Mutual Funds are managed by professional Fund Managers, investors do not even care to see the Portfolio allocation. Hence, they sometime choose the wrong fund and buy at a high, which gives them lower returns. So, the disadvantage is that people become lazy and don't perform their homework correctly. So, friends.. Mutual Funds are amazing investing instruments which should be given time to show its real potential. It's a slow and steady way to create enormous amount of wealth in the long term. Whenever we see an advertisement of a Mutual Fund, we hear - Investments in Mutual Funds are subject to Market Risk. Read the Offer Document carefully before investing. Nice article FI bro.. For common investors who dont understand equities, mutual funds are very rational way of participating in equities through fund managers who can invest on thier behalf ! Could you please suggest some good mutual funds? could not finalise. Dear Stalin. Requirements vary from person to person since you would have seen above that there are multiple kinds of funds. Try to find the best ones from various sites like Moneycontrol or other financial sites which have given steady returns in the last 5 years. They would be the best bets for the next 10 years if well managed. Superb blog... A mutual fund is the best choice for small investors to make more money. there is no any restriction for investing your money in Mutual fund.